On Friday night, I met the girls from the Junior Circle at the Met Roof Garden for drinks, and it was definitely something that I recommend. 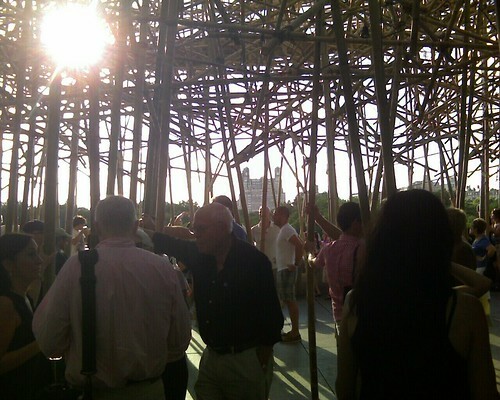 There is currently an exhibition called Big Bambú on the Met Roof, which is a jungle-like arrangement of bamboo poles. The exhibit will continue to grow until October – although I should point out that it’s “growing” because the artists are continually adding to it. When I referred to the exhibit as “growing” on Friday night, someone gently pointed out to me that the bamboo used in the exhibit was no longer alive. The museum leads tours along the paths, which take visitors twenty to forty feet above the roof of the museum. Just the thought of being so high in the air gives me shivers, but it’s definitely something that I want to do. I plan on coming back sometime during the summer (and the day) to take one of those tours. Even though we’re currently embroiled in a disgusting heat wave, the roof wasn’t as steamy as I expected it to be. I think being up high enough to catch a breeze helped on that front. Being on the roof also afforded us amazing views of the city, which were definitely worth the cost of admission (you have to donate to the Met to enter, although you can donate as little as one dollar) and the drinks (the martinis are $11). 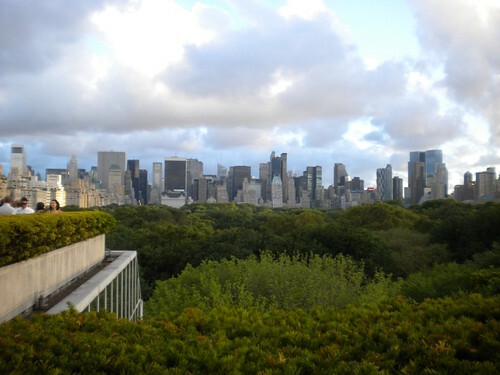 Make a point to visit the Met Roof this summer, and I don’t think you’ll regret it. This entry was posted in Do This, Drinking Out, Museums, NYC and tagged Metropolitan Museum of Art, museums, NYC. Bookmark the permalink.